This is the fourth in my series of analysis of a set of numbers for Nikon DSLR sales (previously: overall volume, DX vs FX, Nikon’s own numbers). This time around, I’m going to tackle the “prosumer" models, starting with the ones with the three digits after the D.
That’s despite the fact that the D300 came out at the same time as Nikon’s foray into FX, and all the things that implies. The cameras charted above have ranged from about US$1800 to US$3200 in list price at their introduction. That’s a pretty hefty price tag, far above average selling price of cameras. But they’re all professional build quality and design, and they’ve all been groundbreakers at their introduction. 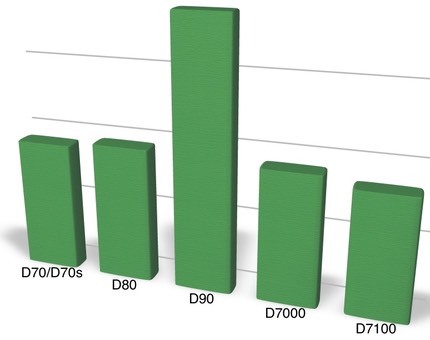 I left off the D7200 because it’s relatively new and still selling, thus its current numbers thus don’t look right compared to the ones charted above. Peak DSLRs were 2011/2012/2013 depending upon how you call the peak. One argument that has been used against my contention that we need a full DX lens set (buzz buzz) is that so many of the DX sales had to be low end models that will only ever get a kit lens on them. 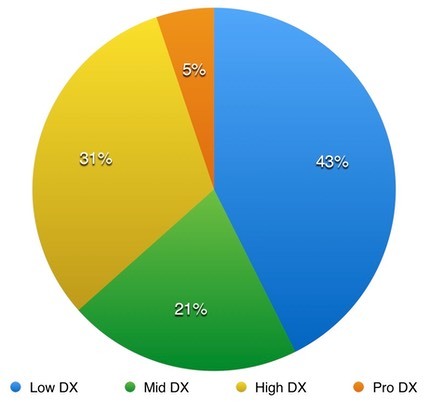 Yet 36% of the DX sales I can chart during the 2007-2015 period are D7xxx and up. Even if I were missing 50% of the lower end DX sales in my figures—which I’m pretty sure I’m not—the high end still suggests very high sales numbers, high enough to warrant a fuller lens set. 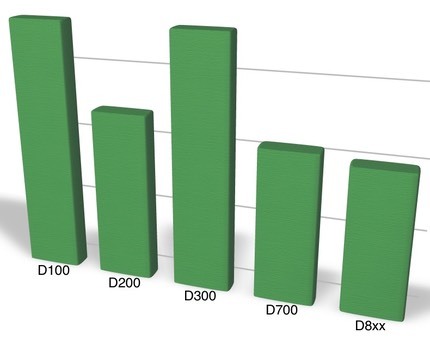 Indeed, even though I knew that intuitively from my long history of following everything Nikon, I was a little surprised at just how high the unit volume in the D7xxx and up category was for DX.